I'm a big fan of fairy tale retellings. One of the first young adult fantasies I ever fell in love with was Robin McKinley's Beauty, a classic reimagining of the story of Beauty and the Beast. I know there's some fairy tale fatigue within YA circles, but as long as publishers release books that might have the potential to enchant me the way McKinley's did, I'll keep on reading new fairy tales. 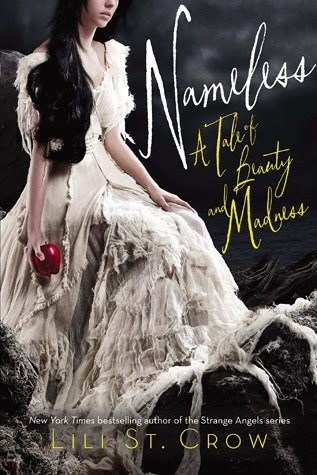 Lili St. Crow's Nameless is an inventive take on Snow White, and the first standalone in the new series Tales of Beauty and Madness. Camille Vultusino mysteriously appeared in the snow ten years ago, and ever since she’s been both blessed by those who found her and wary of accepting that she truly belongs. The Vultusinos are one of the Seven ruling Families of New Haven, and as the adopted Vultusino daughter Cami could take whatever her world has to offer – if she could forget the unknowns in her past or the fact that she’s full-human. Cami’s identity crisis comes to a head when a growing number of mysterious disappearances, family change and the appearance of a gardener named Tor (with scars like her own) converge during the darkest season of the year. This is Snow White, with a bloody bite. Cami is a privileged girl with a charmed life – if you don’t count the missing memory from her early years, a pronounced stutter, feeling like an outsider, and the unsettled state of her adopted family. Still, she has friends, supporters, and Nico, her brother-who-has-become-something-more. It might be enough, if sudden changes and dangers didn’t upset the careful balance. When they do, Cami’s constant brushes with sinister magic build tension and mystery. These, cut together with memories resurfacing as dreams, engender an overall sense of all things horrifying and compelling in Nameless. The best part of the story is the world-building. Families who aren’t just families, but actually inhuman. Fausts, twists, minotaurs, St. Juno girls, prep boys, the rotten Core of New Haven – these are all cornerstones of a world that is fully realized and incredibly interesting. I kept thinking that the setting deserved more time on stage, but I understand why it wasn’t granted that – this is a young adult novel with a VILLAIN, and there had to be time to set up and introduce characters to care about, as well. St. Crow’s fresh take on fairy tale blends stories and myths in a fascinating concept followed up with good execution. Cami’s life among the Seven Families is suitably messed-up, leading to believable tension between characters and in the world overall; these issues then translate into problems that must be solved. Cami creates some of her own roadblocks through sheer voicelessness (her stutter and general difficulty speaking), and that can read as passivity. But in the setting, with this character, it makes perfect sense. That’s not to say that I as a reader didn’t want to shake some sense into her head. I did. However the characterization (in Cami’s case) was spot-on. Add a creepy, mounting sense of doom to all of the above, and you have perfect reading material for Halloween. The only thing that spoiled it was a too-tidy ending. But then, I like a bit of open-endedness in my stories. One more minor nitpick I had was with the character Tor. His part is obvious, and his involvement rushed. I have hopes that he’ll return in a future installment, complete with a full backstory. I was also wary of the Cami/Nico dynamic suggested in the summary, but it mostly worked, given their intense history together (it didn’t make me cringe, as I feared it would). Recommended for: fans of fairy tale retellings (the darker ones like Kill Me Softly or Jack of Kinrowan), and those who like young adult fantasy with a contemporary urban flavor, a la Holly Black's White Cat. I've been curious about this one. It sounds good, I love fairytales, but St. Crow's style rarely works for me. But I think I'll give it a chance. Wow this looks amazing! I haven't seen this around but sounds something like I should definitely read. Great review! Liviania: I hope you do like it! It wasn't a faultless book, and I did keep track of things that didn't work for me, but it also had that compelling factor. I was thinking about it when I wasn't reading it, you know? And I loved the villain. Oh, so creepy!